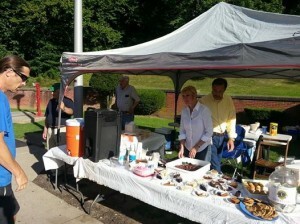 For Memorial Day, Fourth of July, Labor Day, and Thanksgiving, the club sponsors coffee and treats for travelers along Interstate 81. It encourages travelers to take a safety break before they return to the road. It is a great way for us to greet visitors to our region, and you’d be surprised at all the Lion members we meet from all over the world. Here is how it works. Members from our club staff a local rest area typically from 8am to 8pm. We make fresh hot coffee, and club members bring baked goods such as cookies and brownies to share with travelers. Everything is provided at no charge to the traveler, though they can place a donation into our donation jar if they wish. Local businesses also donate baked goods, and recently we’ve begun cooking free hot dogs that have proven to be very popular. We have a great deal of fun and meet wonderful people. For a complete look at when the Lions are running the coffee stop and where, check out our calendar.